So today, this brought me to tears. No you are not looking at the handiwork of one of my littles. I did that. All by myself. After seven years, it is time to paint these walls. These walls that are that special shade of perfectly neutral beige have been this way for the almost seven years we have lived here. Stick with me here as I do the math–seven years. Same number of years that Cooter has been alive. And only two less than our Princess. Yep, these walls have seen their share of handprints and pencil marks and knicks from the wooden hammer in the little tool set. They have spots where tape was stuck and peeled the paint off (lesson learned) and places where I scrubbed too hard to get something off. Suffice to say, it is time. Plus this paint is flat, which makes me feel flat. It’s time to jazz up the color and the finish–time to go with some satin. I come from a line of women who like their color. My Granny had some color of peach walls at one point in her house on the farm. I don’t think I’m misremembering. Her stool was painted a coordinating color before Daddy stripped the paint and refinished it. (He left some flecks of that paint, which makes it all the more precious to me.) 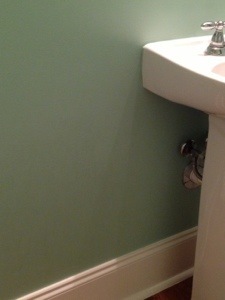 My Great Aunt went with seafoam and mauve in her home when that came in style, and that black and white tiled bathroom? She did all kinds of things with color coordinating in there. My Mama loved her some avocado and then a light green and a pretty blue. I’m following a path of bold color choices, and the pressure is on. I have been picking up samples and trying them out for two weeks at least. I dreamt of a lovely coral with our white trim and wood ceiling. I just knew it would pop. The problem is when I put it on the wall, my Fella said, “Wow, that’s really orange.” And I realized how dark it would make my kitchen and den. We don’t get a lot of natural light and I feared that instead of lighting up the room it would make it dim and dark. So no. In the meantime I was also choosing colors for the “garage bathroom.” It’s not actually IN the garage–just near the door to the garage. It’s where we send folks we like to go. And it too was suffering from flat paint syndrome. You just cannot erase water marks from that kind of paint. I found some blue and green samples, and this is what we went with. It has turned out beautifully, I’m really so pleased. This is how I know I haven’t totally lost my mind or my sense of color, but just barely. The “garage bathroom,” freshly painted and beautiful. It’s hard to tell the exact color, I know, but trust me–it is lovely. Soothing. I want to put a chair in the corner and work from there. Really. 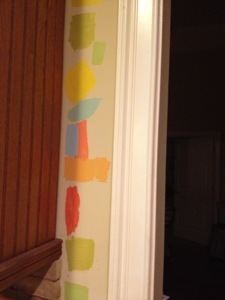 Now that the bathroom’s done, I have to choose the color for the kitchen and den. I want this room to be as perfect as that bathroom. I want it to be inviting and soothing and for the color to reflect what little light comes in and make it seem brighter. Is all that too much to ask of a paint color? Tonight was the last straw. The littles, my Fella, and I went to the getting place and looked at paint colors again. I went, intent on getting two samples. The plan was run home, try them on the wall, pick one, and he would run back and get a gallon while I fixed supper. Problem number one–I have a headache. I can never think straight when I have one of these. So there was that. Problem number two–I’ve lost my mind. The two colors I brought home to try? See those two blobs in the second picture that look peachy? Yeah. They are the same color as the crayon that had all its papers peeled off in the book “The Day the Crayons Quit.” Ahem. Yeah, growing up I used that crayon for one thing and one thing only. Coloring skin color sometimes. How could I possibly have thought it would be a good wall color? Why didn’t a siren go off when I asked for those samples? At that point, I was in tears. Maybe I should just go with the beige. Maybe it wasn’t so bad. Maybe I’d feel better about it when it wasn’t a flat paint and it was all clean-looking. Maybe that blue wouldn’t be bad. Let’s smear a little more and see if we could stand it. 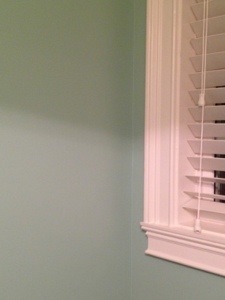 Because that’s how you want to feel about your wall color–“Oh well, it’s okay, I can stand it.” I didn’t want beige because when we lived in Japan on the base EVERYTHING was that color–inside and out it seemed, and that blue kept reminding me of my brother’s room growing up. Tears, people, I was beyond frustrated with myself. And then there was the whole thing that this is such a first world problem. And I use the word “problem” very loosely. I’m whining about not being able to find a perfect color, and it made me not even like myself very much in that moment. My Fella took over supper plans and sent me back to the getting place. He liked the greens, and the blue–but nothing made him say, “That’s the one!” At least he didn’t say it out loud. Poor man. I know he loves that blue. And I’m telling y’all when the time comes to paint our bathroom, by golly, he will have his blue. Just please, not in my kitchen and den. Okay? I called Mess Cat and asked her to talk me off the ledge. She knew just what to say. As usual. And I give thanks for that. I walked through, fingers crossed that the numerous paint people who have prepared a whole rainbow of samples for me would not be there on my second trip today. I walked through, willing my headache to go away, and breathed slowly. 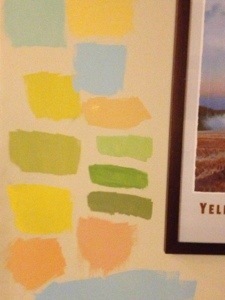 I tried looking at totally different paint chips and choosing colors that weren’t so bold. All the ones I’d chosen before seemed to be too bold for the space. Yes, the romantic in me fell in love with the name first. (And as a sidenote–I would love to be hired as one of the people who names these colors, if anyone hears of an opening–I mean how fun could that be? Wonder if I’d get free samples–that could be quite helpful. So please, if you hear of anything…..) Awesome name. My favorite season. Yes. And the color. It is a lovely golden-yellow that is subtle not bold. It is my hope that it is the perfect color for the sun to reflect upon and magnify as we enjoy another seven years here in these rooms making memories and hopefully not as many marks on the walls. So I got a gallon. It will go down the hall to the bathroom. If we hate it, we can change the color in the den and kitchen, but I’ve got to tell you. I sure hope we love it. Because I found out a few things in this experience. *What looks great on Pinterest does not always look great in one’s own home. *Grief has greatly affected my decision-making skills. Now I understand why Mama had such a hard time deciding on some things after Daddy got sick, and especially after he passed. Somehow I just felt that if I could ask Mama, it would have all worked out. Which is funny because we had different tastes in color for the most part, and I probably would have chosen what I wanted anyway, but the point is that grief has taken away much of my ability to figure out what I want. Love and soothing colors to all.